Now, who doesn't love a good hot dog? OK, I know... not a lot of people do because of "what's in it", but hey... eat in moderation, kosher all-beef is delicious and what's a ball game without a red hot? C'mon now! Summer 2006, the hub and I took a road trip to L.A. and did the sight-seeing touristy thing. As long as I have lived in California (um, all my life), I've never had the chance to see L.A. like how others outside of the state see it. He's from Arizona, so that made two of us. 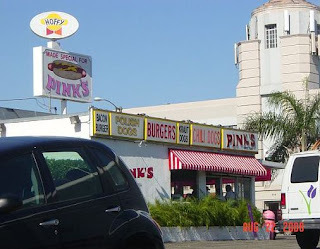 I knew for sure that one of our stops HAD to be Pink's - the infamous Hollywood hot dog stand since the 30's. We actually found parking in the lot on a beautiful weekday late afternoon, and there was only a few people in line. Dude, I wished there was because the menu was a lot for me to take in. Yes *ahem*, I didn't do my research. 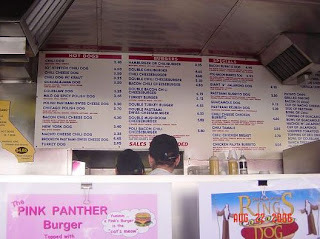 And, below is only half of the menu! 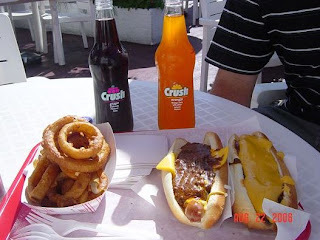 I got the nacho cheese chili dog, hubby got the chili cheese dog, side of onion rings, and couple bottles of grape and orange soda. Mmm! By far, it was certainly a delicious snack. The service was super quick and everyone was friendly. You could tell though that they don't mess around, like "you have to keep the line going so, figure out what you want" type of deal. 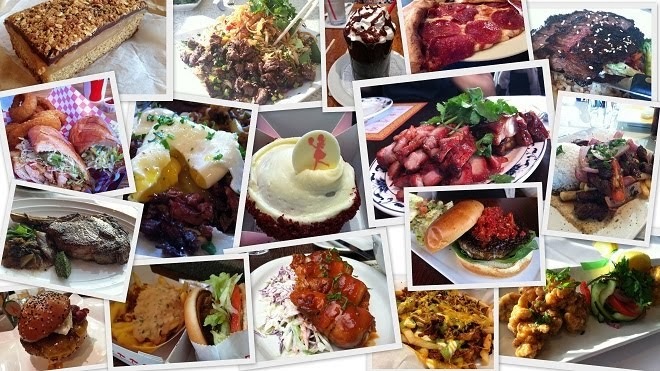 I'm kicking myself for not taking pics of the very small eating area inside Pink's where the celebrity signed photographs are put up. It was pretty busy with diners inside. Definitely a trip worth making... if you're in the area!